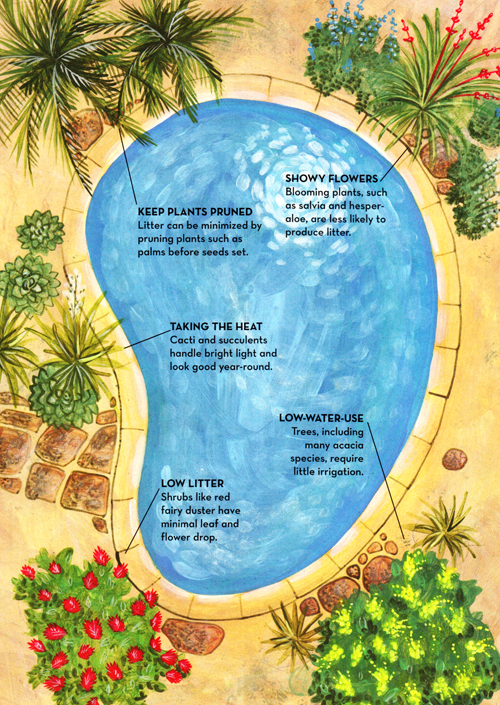 Like a frame around a picture, the landscape that surrounds a pool can really enhance its beauty. By adding some colorful flowers and greenery, all packaged in a stunning glazed planter, will not only look stunning but add some softness to the overall feel. You need to note a few tips before you start your project, to insure that you have the most success. Simple things to consider like selecting plants that don't drop a lot of leaves or flower petals. You don't want to be constantly cleaning the pools surface or taking the chance that something will clog your pool equipment. This doesn't mean that you can't use a beautiful flowering plant, you will just need to place it down-wind from the pool. This simple consideration will help. Another thing to think about is the amount of water a plant will need. If you select a pot with a drain hole, which is the healthiest choice for most plants, you want to consider the run-off that may occur. Don't place the potted plant on a deck where the run-off can create a muddy patch or dangerous situation for slipping. The damage of constant water on the deck is another thing to think about. Of course you can use a saucer to catch excess water and we offer a wide selection of them. Just make sure it's large enough to hold the water and doesn't run over. If the saucer is to small then what is the point of having it. Lastly, we suggest you select some plant materials that have bright, bold colors, and heavenly fragrance all lovenly packaged in a high gloss decorative planter. Just a few tips but all worth considering. Ice Plant - Trailing indigo bush - Yellow morning glory vine.